Baltimore mayor ends city curfew set after Freddie Gray riots. 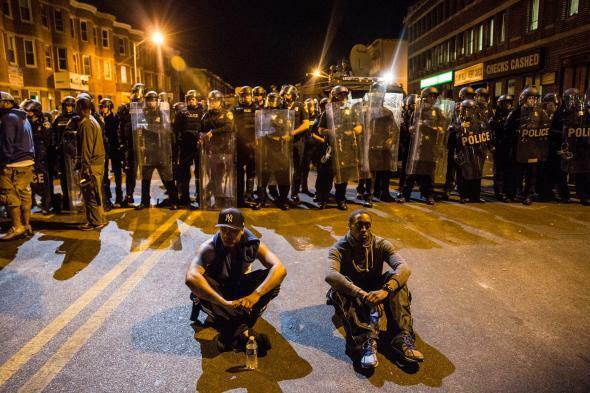 Two protesters sit on the ground in front of riot police minutes before a mandatory, citywide curfew of 10 p.m. on April 28, 2015. Baltimore Mayor Stephanie Rawlings-Blake announced on Sunday morning the end of the curfew imposed on the city in the wake of violence following the funeral of Freddie Gray. The curfew was first implemented on Tuesday night and required people to be off the streets of Baltimore from 10 p.m. until 5 a.m., except for special circumstances, like individuals traveling to or from work. Effective immediately, I have rescinded my order instituting a city-wide curfew. I want to thank the people of Baltimore for their patience. My goal has always been to not have the curfew in place a single day longer than was necessary. I believe we have reached that point today. When Rawlings-Blake announced the curfew on Monday, it was scheduled to be in place until May 4. After the initial night of rioting last Monday, besides spasms of violence, the protests continued largely peacefully while largely respecting the curfew. On Friday, charges filed against the officers lifted the mood, and rallies in the city on Saturday struck a celebratory tone. While the curfew was in effect, businesses and workers complained that it forced employers to shut down early, which took a bit out of employees’ wages, and that it was disproportionately enforced in black communities in the city.